Unusual for Collie during winter, the weather was brilliant, but it did get cold in the evenings and mornings. However, this downside was overcome with the large jarrah fed fire inside a Haulpak wheel rim. Despite the facility having some large dormitory size rooms for sleeping, some hardy souls decided to sleep outside. 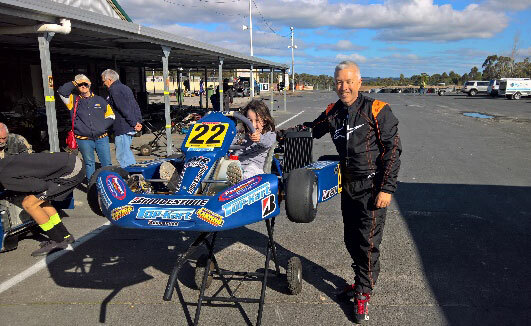 The old Orbits race system (owned by the SuperKart Club of WA) worked perfectly, with one exception. Turned out that it couldn’t record karts with transponders that were left at home. Don’t think an X2 system could have helped here though. Consistent with the culture of KartWest, no-one chose to run new tyres, many $’s saved there. 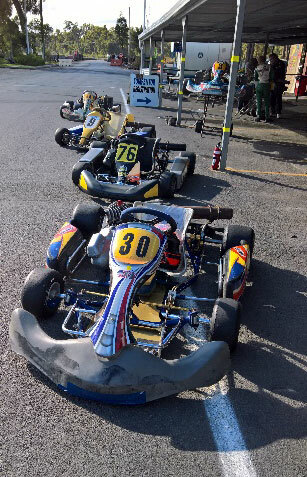 With a one day SKCWA membership of only $15, plus $50 for KartWest 30 day competition licence, combined with a typical total J kart set up cost of $800 or so, this must represent budget racing at its best and with lots of fun thrown in as well. As our first-aid man, Vic Marwick, had no-one to repair, he assisted with the starting. There were 5 rounds of racing on the day, with the first round grid positions being determined by the traditional random draw. No qualifying. 4. TAG 125 – Heavies won by Gordon Harris, Lights by Jess Sanders and PreEVOs by Jeff Sadler. The Collie facility is great in that the pits are right next to the ingrid/outgrid roadway, making it possible to just drive into your pit bay without the hassle of needing a trolley. Great bunch of staff there as well. All the entrants thoroughly enjoyed the day, which was a credit to the SKCWA, KartWest and the officials. 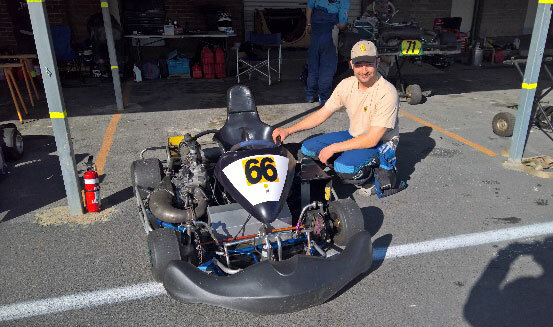 Some of the officials were rewarded with a drive in a kart after the racing had concluded.